What this all means is that, there will be no Puddles of Myself re-launch or redesign. I tried to take on too much too soon and make this blog something that it wasn’t ready to be. I leaned on a few people a little too much and in the end I had to try and undertake the redesign myself, which I wasn’t prepared/didn’t have enough personal time to take care of, what with working a day job and trying to prove to the world that I am one of the five best living writers. So, I was wrong and I’m going to make it up to my Puddlers all around the world. The blog will continue to bring you great, passionate and varied content, but we're going to stay within our identity and our capabilities—which is something I always preach the value of in literature and athletics anyway. Puddles of Myself will be live again starting on 12/19/11. We will take you through the holidays with a list of the World’s Coolest Dude Award Winners from 1911-2011 and I believe that you will be thoroughly entertained by this list. Then, our stable of writers will start posting up their own new works and if you think Mark Jack hasn’t been camped out in Berkeley over the past four months, stewing over god knows wait and just waiting to unleash his heady thoughts, well then you are sorely mistaken. We’ll have some new female writers contributing, which I am especially excited about and we’ll even be working in some video content (slowly, but surely). With my new contributions to SLAM Online, there may be less sports writing on here from me and more general cultural/spiritual musings, but that’s good so I can then bring back the Puddles of My Podcast in a manner that can consistently entertain you all. All I care about is my Puddlers (and money), so I apologize to you all for the ongoing hiatus. We’ll be back soon enough. Actually, today I’ll give you a little bonus feature. This is a piece that I submitted to SLAM and which they posted this past weekend, only to pull it down because it was a bit too honest. Here, you’ll get to read it in full. Enjoy and remember we’re live again on 12/19/11. I know I am stating the obvious here, but thank God the NBA is back. For me, things were getting bad. I was staying up late, chewing multiple pieces of off-brand nicotene gum, drinking tall boys of Busch beer and watching old 1990’s Chicago Bulls games on YouTube. During my days off from work, I would wander aimlessly around the streets of Brooklyn challenging high school kids to games of pick-up and H-O-R-S-E for money. Then, with my brain still filled with the holy spirit of Jordan’s competitive fire, I would mercilessly destroy them in a whirlwind passion for victory. Yes, things were not looking good. But, now, in some sort of holiday season miracle, we will have an NBA season. My mind is drawn back into focus. I’m drinking less (?) and focusing on current events. My stock portfolio is stronger. Things are good and most importantly we are about to embark on a frenzied free agent period that should put the free agent period the NFL saw this summer to shame. We are going to have players going all over the place. So, in order to temper this madness I am going to provide you with my list of the top fifteen free agents that will be available when teams start training camp on December 9 as well as what team that I believe they will end up signing with. I was going to consider all restricted free agents as part of this list, but instead I am going to list all of the unrestricted free agents and Marc Gasol, who is, in my opinion, the restricted free agent most likely to move. Besides, we can’t get caught up in too much fantasy. Some of you NBA fans might be saying, “Whoa, wait a second, he’s still around?” Yes, that is how far Michael Redd has fallen from the heights of 2004-2008 when he was one of the most respected perimeter shooters in the game. He even played on the “Redeem Team.” Injuries have hampered him in recent years and he hasn’t played 70 games since the 2007-2008 season. However, we’re about to start a 66 game season and that might make all the difference. With Mike Miller’s recent hernia surgery and the uncertainty if he will ever have “it” again, can’t you see the Heat using their amnesty clause on Miller, signing Redd to a more reasonable 1-2 year deal and using him as their knock down shooter? I think so. It’s everyone’s favorite nutcase! (I know, I know he has bipolar disorder, but he is still a little whacky) Delonte is another guy who just can’t seem to stay healthy but can be an asset to your team as we saw in his time with Cleveland and at spots last year with the Celtics. He’s a good ball handler, can make plays and has that level of “irrational confidence,” as Bill Simmons says, that you want on a contender. That’s why I see him re-signing with the Celtics to backup Rondo for another year. 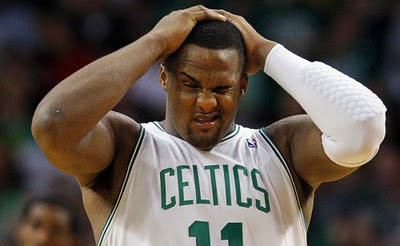 Though, the Celtics could trade for Chris Paul in a monumental deal and everything I’ve said could be shot to hell. We continue with another one of the Boston Celtics’ free agents. We all know that Davis is capable of giving a team points, energy and rebounds off the bench. He takes charges better than possibly anyone else in the league and can even step up and hit a big shot from time to time. He had his best statistical season in 2010-2011, but strangely, it didn’t feel that way. In previous years, “Big Baby” had fit into place with what the Celtics did and did exactly what they needed him to do when they needed him to do (for the most part). His 2010-2011 season seemed to lack that trait. It appears that his time in Boston has come to an end. I see Joe Dumars looking at his defensive background from his time in Boston and finding potential value in him as a glue guy and signing him to a possibly bad contract once they amnesty Rip Hamilton. It’s a Boston free agent bonanza! I guess that makes sense since they only have six players actually under contract. Kristic will never be confused with Charles Oakley or even Nick Collison; he lacks a certain interior toughness to his game. However, he can make shots, make the defense respect him, pass and, most importantly, provide scoring to take the burden off Kevin Garnett to be the only low-post presence for the team. I think Boston resigns him, though it will be important for the Celtics to really pick up another center who is more of a rebounder-defender so they can actually bring Kristic off the bench to spell Garnett rather than play them together. Prince will be 32 years old in February, but he can still get around 14 and 5 every night. His defense has slipped slightly over the past two years, but wouldn’t your effort wane if you were playing alongside Ben Gordon, Charlie Villanueva and their bloated contracts every night? Prince is a heady player who can pass well and will play defense when part of an actual professional team like those mid-2000’s Detroit teams. Doesn’t that sound like the current Boston Celtics? I think that the Celtics don’t end up trading for Paul and make one last run at the title in the shortened season. I know Prince is looking for one last contract, but I think the Celtics can sell him on the following: one year deal, playing for a contender, playing with three Hall of Famers and Rondo, increasing his worth during a title run and then parlaying that into one final long-term contract next year with another team. I feel like Prince would buy into that. He still has some personal PR work to do to wash the stink of the last two messy years in Detroit off and Boston is the perfect place for that. Last year Sam Dalembert made 13 million dollars. That fact is literally one of the reasons why there was a lockout. 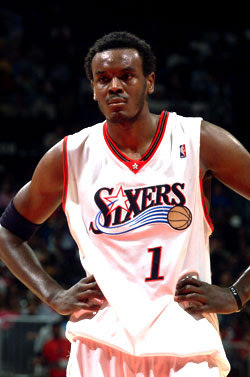 Sam Dalembert is not a great player and he made 13 million dollars in 2010-2011. Sam Dalembert is still not a great player but interest has been piqued in him because he seems to be the perfect fit for the Miami Heat. His fit with the Heat has also been tied to his Haitian nationality since Miami hosts a large Haitian population and is also as close in proximity to the island as he can get playing anywhere in the league. Still that 13 million remains a problem. Will Dalembert actually demand that kind of money or will he follow the Miami Heat model of accepting less (in his case significantly less) money in favor of playing with Wade, Lebron and Bosh and being the favorite to win the title. I mean trotting out a lineup of Chalmers, Wade, Lebron, Bosh and Dalembert would be pretty ideal for the Heat. Besides being defensively imposing, the Heat could then use Haslem and Anthony off the bench for scoring toughness and energy and come up with a more solid 1st team/2nd team dynamic using Wade/Lebron and the Miller or Redd role to handle the second unit scoring. It would be something far closer to those 90’s Bulls 1st/2nd teams that were so useful and effectively used during their title runs. It all makes too much sense, as long as Sammy realized he’s not worth 13 mil. Since the 2005-2006 season (AKA “Chris Paul Year One”), David West has been one of the most consistent low-post players in the league. He’ll basically get you 18 and 8 every night and he’s proven that he can do it with Paul out of the lineup as he did for much of the 2009-2010 season. Unfortunately, he suffered a nasty ACL injury late last season and is still rehabbing. I’m only putting him this low because you don’t know how he will respond from injury at 31 years old. I still think he re-signs with the Hornets as they try to convince Chris Paul to stay in New Orleans. And even if they end up trading Paul, they can keep West in place and try to reinvent their team in a similar way that the Nuggets did when they traded Carmelo last season. Denver set the model with how to deal with a modern superstar requesting a trade to only team and the Hornets would be wise to follow their lead. J.J. Barea was a key part of the Mavericks’ run to the title last year. We all know this. He tore through the Lakers when the Mavs dominated them and only got stronger as the Finals went on. Because of his strong, clutch play and the way the NBA works, its natural that someone is going to throw too much money at him during this shortened free agency period. Barea made 1.8 million last year, which is a bargain. I can easily see the Nets or some other team offering him something along the lines of 5-7 million per year when the most appropriate range is 3-4 million. Despite this, I still feel that Cuban and the Mavs find a way to structure a deal with Barea so that he resigns. Roddy Beaubois is not a sure bet and they truly value Barea for energy/chemistry. I think he stays in Dallas. O, prodigal son, Jamal Crawford! I don’t know why I wanted to say that, but it felt right. Crawford has always been that strange mix of talent and total lack of self-awareness/understanding of the game of basketball and its history. He can score and shoot with anyone but still makes some of the worst decisions in the game and takes some of the worst shots. He’s been of great worth to the Hawks the last two years and really showed up against the Bulls in the playoffs last year. He’s coming off his weakest statistical season since 2005-2006 and he made 10.8 million last year. He’s one of those “irrational confidence guys” (again citing Simmons) that can score and every title contender needs that. However, I just don’t see what contender can fit him in right now. He supposedly wants to go to the Bulls but I don’t know if they can afford him. I see him resigning with the Hawks. Crawford is a baffling player and the Hawks are a baffling team/franchise (except Horford). They deserve each other. One of my all-time favorite players. Seriously, please go back and watch Grant Hill from 1995-2000, you’ll be amazed at how you could forget that he was perhaps the most well-rounded player in the game besides Michael Jordan. You have to be impressed at how he clawed back from the brink of retirement and transformed himself into some kind of latter day Scottie Pippin who can defend, shoot and handle the ball. He doesn’t score like he used to, but if you were 37 and your body was ravaged by injuries for years you wouldn’t be able to score like it was 1996 either. Like Steve Nash, I want Grant Hill to wind up on a contender and win a title. 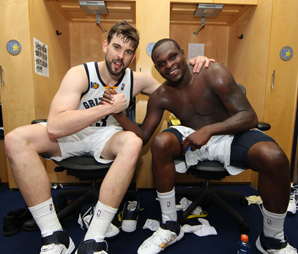 But for some reason, he and Steve Nash share this great sense of loyalty and decency that stems from them being honorable, smart and good human beings and I just feel like Grant stays in Phoenix with Nash. And that’s some kind of tragedy for them both. J-Rich had a disappointing season last year with Orlando, but really, what wasn’t disappointing about last year’s Orlando team? Since his tutelage under Steve Nash, Richardson has become quite a useful shooter and player. On the right team, he can get you 19 points a game and shoot 40% from three-point range, like he did on the Suns in 2009-2010. Orlando needs to come up with ways to keep Dwight Howard and surround him with shooters that he can pass to. I think Otis Smith will make a strong effort to re-sign Richardson and I think he will end up staying with the Magic. Besides Dirk channeling vintage Larry Bird and also mastering his own ridiculous array of off-balance shots, Tyson Chandler was probably the biggest reason why the Mavericks beat the Heat in the Finals. 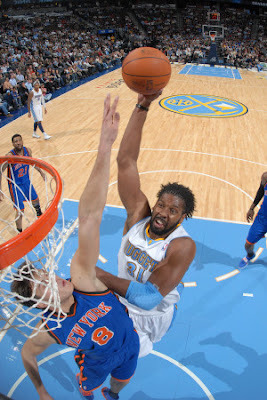 Chandler just always seemed able to grab that extra rebound or be open for that alley-oop or emphatic dunk. He was a presence on the interior that Miami just couldn’t match. Chandler has already started playing games in the media by saying that he doesn’t think the Mavs will resign him, which could be true. But at this point Tyson Chandler should know who he is. He’s only a good player when he plays with Chris Paul or is part of a true, deep team like last year’s Mavs. And, really, the Mavericks are the only place he makes sense (Miami, New York and Boston would too, but they don’t have the money/space). In the end, I think the Mavericks do try to make a deal with Chandler, but that the Rockets sneak in and offer him a little bit more and manage to lure him to another part of the state of Texas. You have to watch out for Daryl Morey. Now, you might see this and say, “Shane Battier at number 3! Domino you are crazy!” And, sure, you might be right, but Shane Battier is this high precisely because of the same reason he is so valuable on the court—intangibles. For some reason, a team with Shane Battier is that much smarter and tougher. He helped Memphis reach the playoffs for the first time in franchise history in the mid-2000’s; he was great for the Rockets for the past few years and was great again for Memphis last year during their run in the playoffs. He plays great defense, can pass, make threes and is conducive to chemistry. I think that the Grizzlies and the Heat will make the strongest offers for him. And, because Battier is a good guy who values team chemistry, I think he re-signs with this current Grizzlies team to make another deep run in the playoffs. A center who can get you 14 and 8 over the course of a season is rare in the NBA these days, but that’s what Nene has done over the past three seasons. He can score in a variety of ways and plays great defense. He can pass and rebound and more than anything, he’s tough. He’s played 75 or more games the last three seasons after a string of injury-plagued years and by all accounts, at 29 years old, seems to be in the middle of his prime. You can’t put a premium on having that kind of player, that kind of interior presence on your team. Miami would kill to have him. New York would kill to have him. Boston would kill to have him. But I don’t think that any of those teams have the remote possibility of getting him. I think that after watching how Nene anchored the “Post-Carmelo Run N’ Gun Nuggets,” that the Golden State Warriors will use their amnesty on Andris Biedrins and sign Nene. Then they can trot out a lineup of Stephen Curry, Montae Ellis (until he’s traded), Dorrell Wright, David Lee and Nene. Wouldn’t that lineup be as competitive and exciting as the Nuggets’ team at the end of last season? Then, they can bring other young athletic players like Klay Thompson and Ekpe Udoh and a journeyman like Louis Amundson off the bench for energy and toughness. That’s not a bad team dynamic and identity to have heading into the season and they can always evolve and pick up better fitting pieces if they trade Ellis. Nene to the Warriors! Let’s bring some excitement back to G-State. I’ve already covered why he’s valuable in my last piece. He’s the only restricted free agent on this list and he’s the third best center in the league. Of course he’s the number one free agent on the market. And I think he’ll stay in Memphis for the foreseeable future. Despite Randolph’s contract, I think this franchise is getting smarter. But, then again, you never know what can happen. Maybe Gasol decides to take way less money and goes to Miami and the Heat do win the next six titles. That sort of sport’s fan nightmare is in play. And so are many other possibilities like potential CP3 and Dwight Howard trades and plenty of other, less valuable free agents changing cities and possibly adding depth to teams that you never even imagined. On December 9, 2011, all of this is in play again. We’ve got our characters back; we’ve got our stories back; we’ve got our game back. God, I love Christmas.